Beer Mornington Peninsula Brewery #tinnage003 Whysocereal? Mornington Peninsula Brewery's range of limited edition can releases going by the #tinnage banner reaches entry number 003. The beer to get the call up and done fancy new clothes is an oatmeal pale that originally appeared as a limited release, draught only beer. 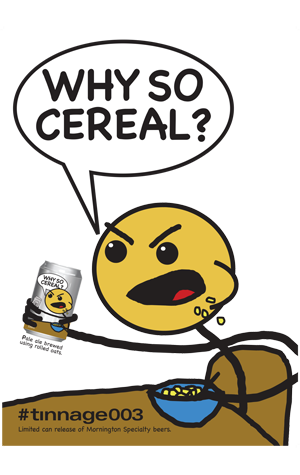 Now it's been reinvented as Whysocereal? complete with angry cartoon-adorned tin. A mere 400 cases have been produced and are being distributed nationwide. Brewer AG reckons it's a "highly smashable summery ale with lovely citrus and pine notes on the nose and palate." The brewery is also running a social media competition tied to the beer. You can find out more by clicking the icons in their brewery details on this page.